This is a gorgeous collection of classic Moroccan stews, beautifully presented with more than 150 photographs by Martin Brigdale. It includes step-by-step techniques for preparing couscous, as well as simple recipes for harissa, chermoula, ras el hanout, preserved lemons, smen, and mint tea. It offers rich and aromatic ideas that include Tagine of Monkfish, Shellfish K’dra with Lemon Couscous, Chicken Tagine with Green Olives and Preserved Lemon, Tagine of Spiced Kefta with Lemon, and Okra and Tomato Tagine. Clear step-by-step instructions are easy to follow, and a mouthwatering image of every finished dish allows you to see what you are aiming to achieve. Full nutritional notes are provided throughout. Ghillie Basan brings together a wealth of experience in the cuisine of North Africa to create this irresistible collection of tagines. It contains something for every taste, including vegetable, fish, shellfish, poultry and meat tagines, as well as basic instructions for couscous, Moroccan spice mixes and other accompaniments. The recipes contain simple method text and inspiring technique photographs, making traditional tagines accessible to every home cook. Advice on equipment is included, and there are plenty of tips and variations to help you get the most of out the book. Try your hand at Beef Tagine with Sweet Potatoes, Baked Vegetable Tagine with Harissa Yogurt, or Tagine of Duck with Chestnuts and Pomegranate Seeds. 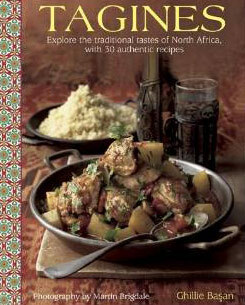 With 150 glorious photographs, this vibrant book will delight every lover of Moroccan food.